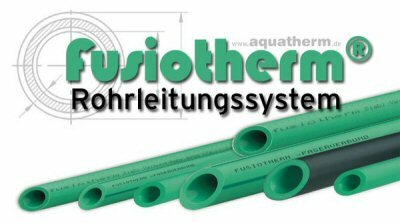 The plumbing system of Maryland's 2005 Solar Decathlon house will feature Aquatherm Fusiotherm polypropylene pipes. This piping system consists of green polypropylene pipes and fittings that are fused together with heat. This process yields a seamless piping system with no joints to crack or break under fatigue. Polypropylene is also more environmentally-friendly than comparable home piping technologies. The most widely used pipes in homes today are made of PVC, which is a slightly flexible, white plastic. The manufacture of PVC involves many additive chemicals used to stabilize the PVC, including heavy metals such as lead, cadmium, barium, and zinc. The installation of PVC piping also requires the use of toxic glues and primers. To install Fusiotherm piping, a heating tool is used to heat the pipe and fitting where the pipe is going to be inserted. This process takes approximately 2 minutes. Next, the pipes are joined together by hand and allowed to cool for approximately 1 minute. The joint is now fused, and the pipes are now ready for pressure. Fusiotherm fittings are available in a wide variety of sizes and types, and can be custom manufactured if needed. The pipes are certified for both hot and cold potable water, and can be manufactured for both indoor and outdoor used. Fusiotherm pipes have been in use for many years in Europe, and were just recently certified for use in the United States. Aquatherm is a German company that produces over 150 kilometers of piping a day for residential, commercial, and industrial uses. Please visit their website.